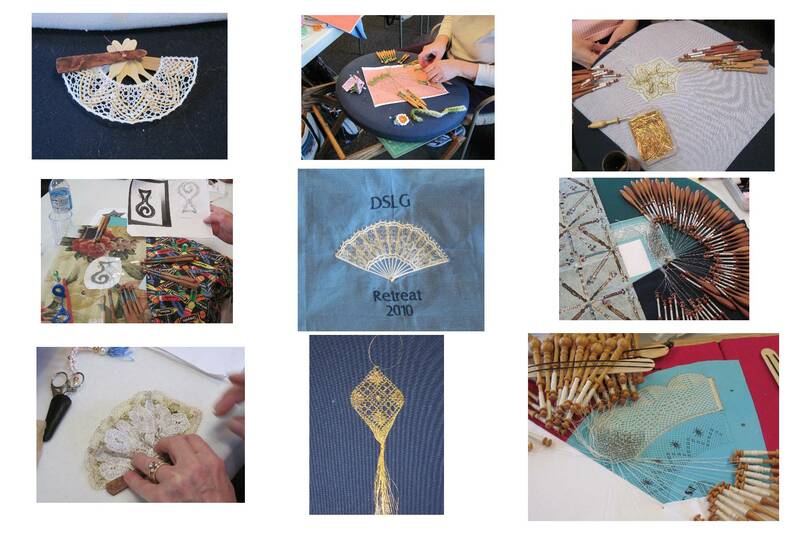 Last weekend the Doris Southard Lace Guild held a lacemaking retreat in Dubuque, Iowa. We met Friday night at the retreat center and went out for dinner. The rest of the weekend all our meals were at the center and we moved from our bedrooms to the conference room to the dining room and back. It was wonderful! The theme was fans, so most people worked on a lace fan of some sort. We didn’t have to, but it was a good impetus for me to get back to working on the s’ Gravenmoerse fan I had started a long time ago. Through the weekend I got about 5″ of the lace made and am really happy with my progress. I was able to get some of the lace out from under the pins so I could see how it is turning out. I’m happy with it so far. This lace will go along the edge of some fan sticks that I got from Lacy Susan at the 2008 IOLI convention in Rockford, IL. Some of the ladies at the retreat finished small fans that will go on fan sticks made by John Aebi. Cynthia’s will be a nice brooch and I think Jaquie’s is a little larger for her battenburg lace. Sally was using the time to work out the design for a pricking she has with no directions. Carla started her fan and made huge progress. Others had projects already on their pillows that they worked on. It was a great time to make a lot of progress. We had just a few interruptions when we went up to see what the quilters were doing at their retreat. They had machines and irons and fabric all over the place. Carla made the embroidered cover cloths as a keepsake for the retreat. I came home with lots of goodies, thanks everyone, and lots of energy and ideas. I’m ready to do it again. 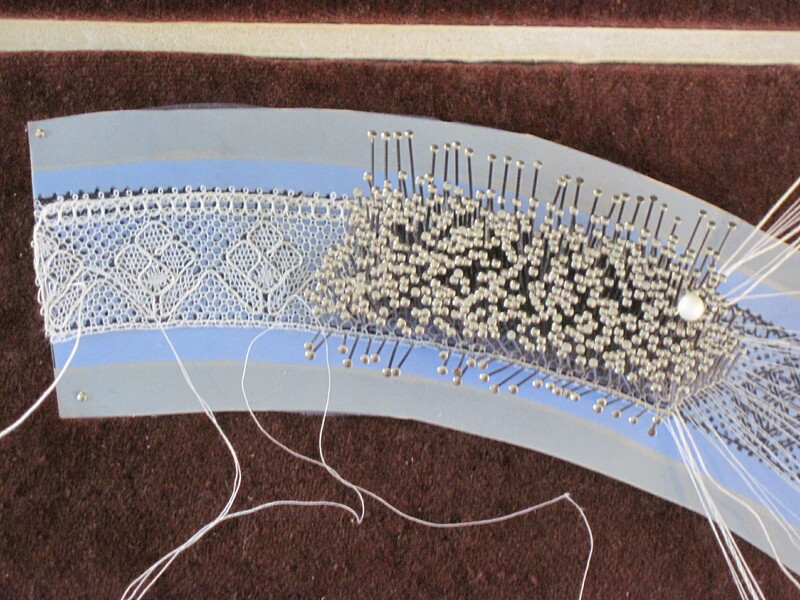 What a lovely bobbin lace pattern! It is such a neat, clean pattern.